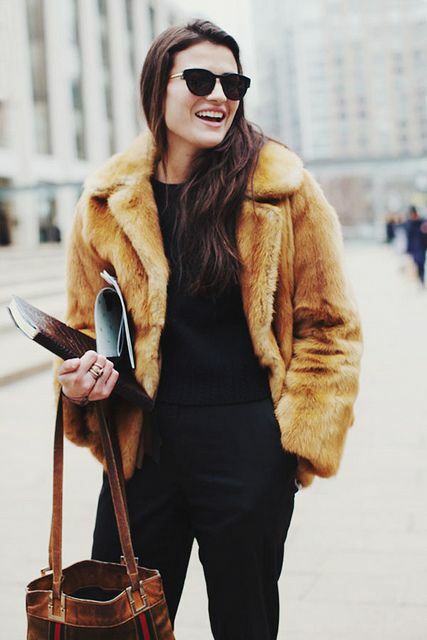 A short warm fur coat will keep you cozy in the winter yet being comfy in wearing. How to create your own short fur coat outfit? Choose the style you want – grunge, glam, casual or any other, and then create the basis of your look. A maxi dress (it may be a sweater dress) paired with a fur coat is a cool idea for casual style, or you may change it for glam taking a cool glam gown. Black leather leggings or jeans with a black top and a colored fur coat is an awesome dramatic idea, don’t forget some black heels. Flats, blue jeans and a grey or white top with a fur coat is nice as everyday casual. Get inspired and keep yourself warm!